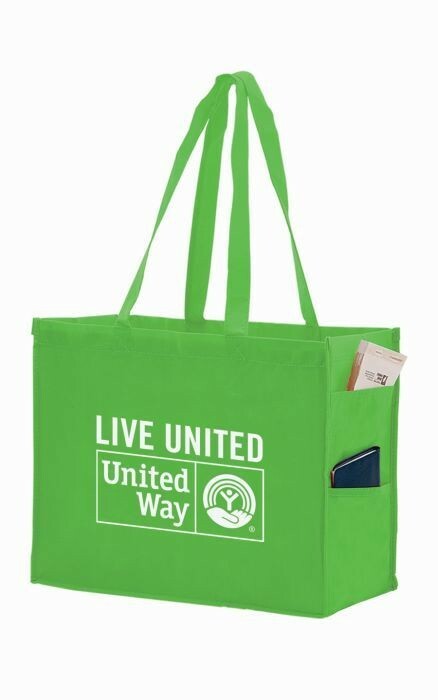 Our Non-Woven Tote is made with durable, reusable non-woven polypropylene. Features 28 inch reinforced over-the-shoulder handles. Convenient single and double pockets on the side gussets to hold personal items for easy access. Available in your choice of 14 bright colors. A fantastic water repellent, tear resistant eco-friendly bag. Perfect for trade shows. Related: custom products, custom, bag, bags, gift, gift bags, gift tote bag, tote bag, gift box, gift boxes, box, tote, totes, outdoor, grocery, grocery tote, grocery bag, plastic bags, bags plastic, paper bags, nonwoven, nonwoven bags, nonwoven tote, clay coat bags, eurototes, laminated bags, gloss laminated bags, matte laminated bags, paper bags, woven bags, shopping totes, luggage, drawstring backpack, patch bags, laundry accessories, laundry, laundry bags, full color, digital, digital bags, custom, boat bags, foldup totes, promotional tote, promotional, advertising, marketing, reusable bags, tissue, tissue paper, handle bags, drawstring bag, cotton drawstring, cotton drawstring bag, polybag, poly bags European rope handle bags, rope handle bags. Price includes 1 color silkscreen in one location. $0.48(V) for each additional color or location. $45(V) For a one color silkscreen in one location. Set-up charge applies to all reorders.